3 What next for the European tomato trade? Key players in the European tomato business will meet in Düsseldorf, Germany, on 1-2 June for the inaugural edition of the European Tomato Forum. With expert speakers and panellists drawn from countries including Belgium, France, Germany, Italy, Spain and Ukraine, the event aims to provide useful information about the entire European tomato market – including facts and figures on the overall market as well as individual countries. “With registrations so far from all parts of the value chain, and especially from across the food retail trade, make us very optimistic that we will see a very intense and fruitful congress,” commented Kaasten Reh of Fruitnet Media International, which organises the event in partnership with market research group AMI. The new event will place particular emphasis on the opportunities and challenges presented by segmentation and differentiation in the European tomato market, as well as on opportunities to communicate more and better with consumers. For many of those operating in the tomato supply chain, the recent shift towards range expansion and product diversification has seen many segments of the category increase in value. 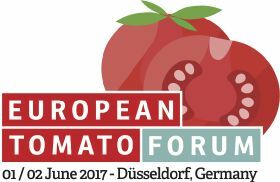 The European Tomato Forum 2017 on 1-2 June offers a unique chance for tomato suppliers and marketers to explore this and other trends by connecting with several of the food retail industry’s buyers and decision-makers. Further information, including a full programme and details of how to register or sponsor the event, can be found at the official European Tomato Forum website.